Spring is in the air and koel’s coo reigns supreme. The fresh green is sprouting on every tree and the new leaves are raising their heads to get a peek of the world which is now theirs. Holi is a festival that truly accentuates the beauty of this enchanting season. The world waits for it every year but the court of the king of Benaras waited for Holi for a different reason for it was now that they heard the various new songs prepared for Holi by the singing Baiji’s of Benaras. Hori compositions described the spring season and were usually based on the love pranks of Radha-Krishna. The mood of these compositions was joyous and playfyl and illustrated the divine leela of Lord Krishna. The sagas of color throwing Radha Krishan Holi Episodes tales form Folklore and the mythological references were meshed together to create colorful melodies that enhanced the magic of Holi. Though Horis are supposed to be about the love pranks of Krishna and Radha there exist some delightful exceptions too. One such Hori is based on Raag Khamaj that revolves around Ram and Sita etched on the theme of Ram Siya phag Machavat. The Holi appearance of these Baijis in the court was followed by singing int eh various Bajra’s of the seths for one full month and this was when jealousy reigned supreme for many a noble fought for the privilege of hearing a Baiji first. It was one such incident that led to the stabbing of Janakibai 56 times who survived the attempt and appeared later in many mehfills to be called Jankibai Chappan Chhuri. Singing bais such as jagdanbai Badi Moti, Rasulanbai, Siddheshwari Devi amongst other illuminated many Hori Mehfil’s with their sweet melodies. Each mehfil had its own charm and appeal. The men dressed in white silk with pagdis on their head the thandai sherbet and hukka being passed around the heady rose water sprinkles being sprayed by young boys and the women in yellow behind the ‘purda’ added to the magic of pure music. These mehfils set the precedence to the traditions of singing Hori rendered in two distinct stles – Pakki Hori and Kacchi Hori. Pakki Hori is the classical based sophisticated and dignified form of singing in Dhamar Style whiel Kacchi Hori is sung as a semi classical melody in Raags like Khamaj Kafi etc… rendered in deepachandi Taal in which fast tans are used taking off from the old Hori tradition Shobha Gurtu Girija Devi and Ajay Chakrabarty further made Hori Popular in concert circuits. 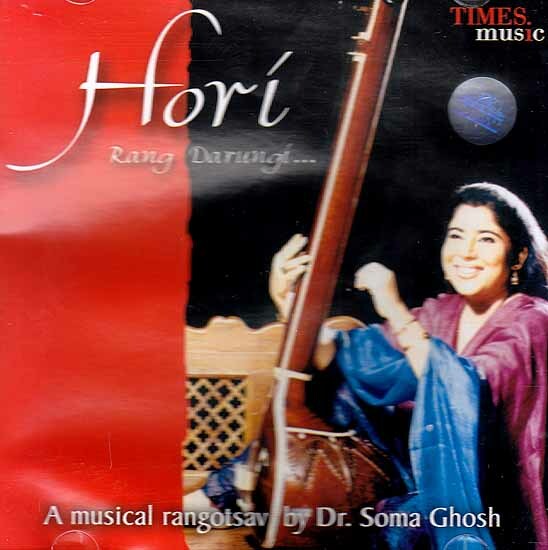 Now Dr. Soma Ghosh takes this unique and joyous form of singing to new heights with their melodies renditions. Associated in her style with such giants like Pt. Omkarnath Thakur of Gwalior Gharana through his principle disciple Dr. Chitranjan Jyotishi Dr. Soma Started her training under the tutelage of her mother Smt. Archana Chakravarty at the age of thirteen. She completed her Sangeet Prabhakar form prayag Sangeet Samiti Allahabad and has thus been groomed in the traditional Banaras Gharana under Pt. Narayan Chakravarty. Her style is a blend of playful expressions form Gwalior Gharana and the throwing technique of Senia Gharana. ‘A’ graded artiste of all India Radio she has won critical acclaim not only for her fine melodius voice that touches the taarsaptak without a falsetto not but also for working out different tints and shades of underlying emotions through a sensuous stress on the words of Thumri. In this album she strives to revive the century old Bandishes on the brink of being forgotten. She gives the age old folk songs an identity again by rendering them in the form of geet and by orchestrating them with the means of modern recording techniques contemporary instrumentation and creation of atmosphere enjoy the color and the ecstasy of Hori.